The best way to stop a fire is to never let it start. Watch your cooking. Stay in the kitchen when you are frying, grilling or broiling food. If you must leave, even for a short time, turn off the stove. Give space heaters space. Keep fixed and portable space heaters at least 3 feet from anything than can burn. Turn off heaters when you leave the room or go to sleep. Smoke outside. Ask smokers to smoke outside. Have sturdy, deep ashtrays for smokers. Keep matches and lighters out of reach. Keep matches and lighters up high, out of the reach of children, preferably in a cabinet with a child lock. Inspect electrical cords. Replace cords that are cracked or damaged, have broken plugs, or have loose connections. Install smoke alarms. Install smoke alarms on every level of your home, inside bedrooms, and outside sleeping areas. Interconnect smoke alarms throughout the home, so that when one sounds, they all sound. Have a fire escape plan. Make a home fire escape plan and practice it at least twice a year. The easiest way out of your home is not always the safest way out during a fire. Portable fire escape ladders will provide an alternate escape route from second or third story windows. The National Fire Protection Association (NFPA) recommends one ladder in every occupied room on floors above the main level. Escape ladders are available for purchase through retailers, including hardware and major department stores. Be careful when using candles. Keep candles at least 3 foot from anything that can burn. Blow out candles when you leave the room or go to sleep. Smoke alarms are a key part of a home fire escape plan. When there is a fire, smoke spreads fast. Working smoke alarms give you early warning so you can get outside quickly. Here are a few smoke alarm tips from the Scottsboro Fire Department. Test all smoke alarms at least once a month. Replace all smoke alarms when they are 10 years old. If your alarm doesn’t have 10 year sealed Lithium Ion battery, replace the batteries every 6 months. Smoke alarms should be installed on every level of the home, including the basement. Make sure each sleeping area has at least one smoke alarm, along with common areas such as hallways and family rooms. Remember, HEAR THE BEEP WHERE YOU SLEEP. Smoke alarms should be installed according to manufacturer’s recommendations. Alarms installed in the kitchen area should be at least 10 feet away from cooking sources to prevent false alarms. Interconnected smoke alarms provide the best level of notification. When one alarm is activated, all the connected alarms sound ensuring you have the best chance of hearing the alarm and exiting the house. Special alarms are available with strobe lights and bed shakers for those who are hard of hearing. Alarms are also available that can play back a parent’s recorded voice, waking small children with instructions from Mom or Dad. If you need any assistance testing or replacing your smoke alarms, call 256-574-2617 and we’ll be happy to help. Often called the invisible killer, carbon monoxide (CO) is an odorless, colorless gas created when we burn fuels —gasoline, wood, charcoal, natural gas, propane, oil, and methane. Addressing your address sign One of the biggest delays in emergency crews getting to your home can often be finding your address. House numbers that are not properly marked or hard to see can cost responders several minutes when seconds are important. Be sure your house number is visible both day and night, preferably with reflective numbers, when driving from both directions. 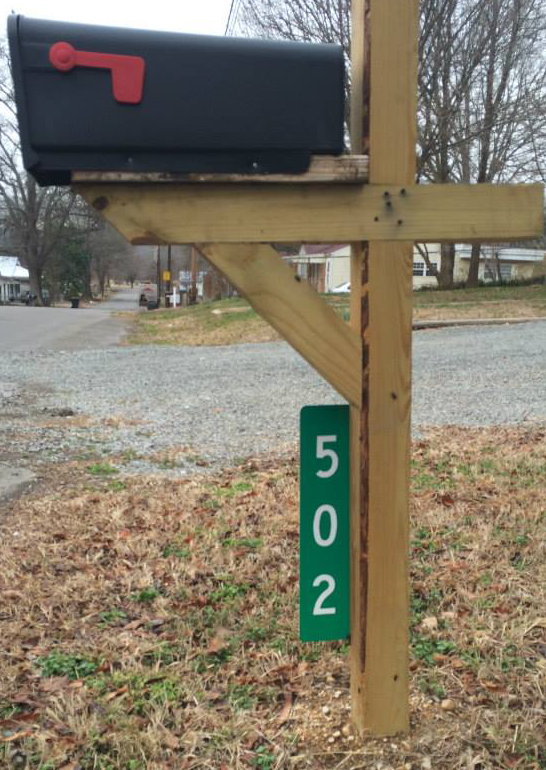 The Scottsboro Firefighter’s Association sells address signs like the one pictured here. These are available with your house number for $15 each. If you would like more information, contact Office Manager Brandy Fowler at 256-912-0537. Plan Ahead! If a fire breaks out in your home, you may have only a few minutes to get out safely once the smoke alarm sounds. Everyone needs to know what to do and where to go if there is a fire. MAKE a home escape plan. Draw a map of you home showing all doors and windows. Discuss the plan with everyone in your home. Click here for Sparky’s guide to escape plans. HAVE an outside meeting place (like a tree, light pole or mailbox) a safe distance from the home where everyone should meet. TEACH children how to escape on their own in case you can’t help them. Click hear for our Kid’s Escape Worksheet. IF you have to escape through smoke, GET LOW AND GO under the smoke to get out. CALL 911 from OUTSIDE your home.